Sterling is suffering from “no deal” Brexit fears and a strong dollar. LONDON – In line UK GDP growth in the second quarter failed to revive the bombed-out pound on Friday. The UK Office for National Statistics said on Friday morning that its preliminary estimate for UK GDP growth in the second quarter was 1.3%, in line with economists’ forecasts and up from 1.2% in the first quarter. Quarter-on-quarter growth came in at 0.4%, in line with consensus forecasts and up from 0.2% in the previous quarter. The figures failed to do much to reverse the poor performance of the pound on Friday. 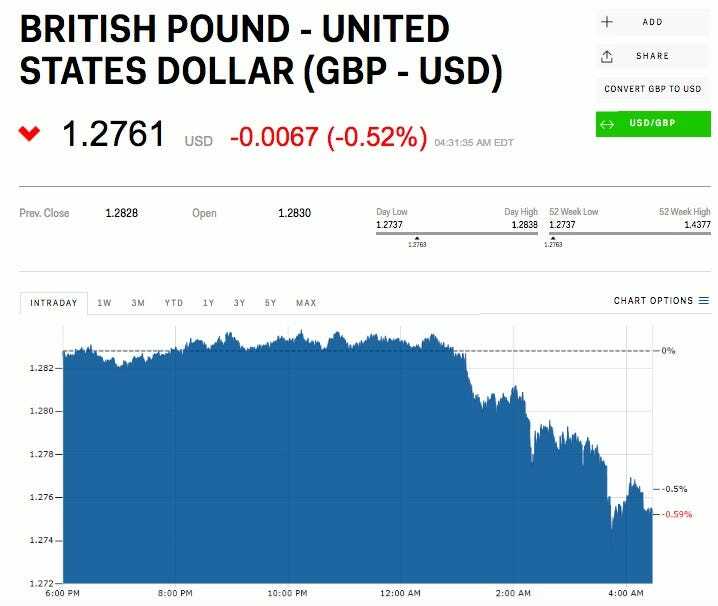 Sterling has been under pressure all week amid rising fears of a “no-deal” Brexit. A rallying dollar put more pressure on the currency. The dollar index, which measures the currency’s strength against a basket of others, hit its highest level since June 2017 on Friday. 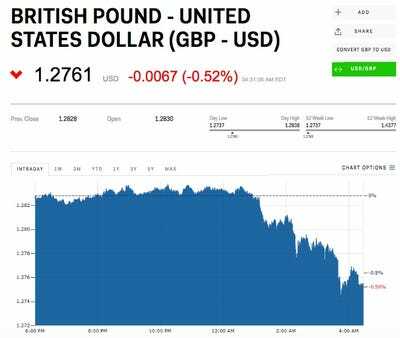 The pound was down 0.5% against the dollar to $US1.2761 at 9.31 a.m. GMT (5.31 a.m. ET), a minute after GDP figures were released. It marks a fresh 11-month low for the pound against the dollar. “The fears of a no-deal Brexit have piled the pressure on the pound and the dollar’s rally has come as a sucker punch,” Neil Wilson, the chief market analyst at Markets.com, said in an email. The pound was up around 0.11% against the euro at the same time. The euro is suffering amid concerns about possible contagion from Turkey’s economy and currency spreading to eurozone banks.